The first time I heard about The End of Our Story was at the HCC Frenzy Preview. The cover instantly caught my eye, but it was the plot that hooked me. The story of a couple’s break-up, told through flashbacks and present trauma. It sounded right up my alley. When I was offered an ARC through the Teen ARC program at my work, I immediately requested a copy. I dived head first into this book. I was emotionally invested in the characters from page one. Watching their relationship blossom, deteriorate, and rekindle (slowly, tentatively, and hesitantly) was engrossing. 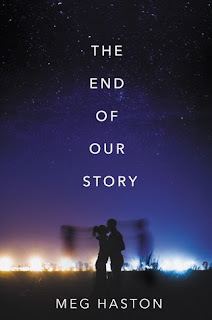 Most books I’ve read start when a relationship is beginning, but The End of Our Story focused on how relationships can break, and the aftermath of that devestation. I loved how thoughtfully this book was plotted. The back and forth between Wil and Bridge, between the present and the past kept me engaged and aching for more. The writing itself was poignant, beautiful prose. Small sentences would stick out, the smart and heartfelt way Meg Haston would phrase things made it all the more captivating. It was a story where I wanted to read every word on the page, where I wanted to take my time to let myself soak in the prose. It wasn’t flowery or overly descriptive language, but simple direct ways of making the most ordinary phrases into something a little more moving. I’m going to avoid directly addressing the plot, because I don’t want to spoil it. I still feel, months later, that I’m processing just what happened. I think the problem for me was that I was not anticipating the novel to take such a dark turn. I am usually able to prepare myself, so when the big plot point happened in The End of Our Story (near the beginning of the novel, no less) I was shocked. It took me awhile to process just what was happening, which did pull me out of the story sometimes. It was the characters though, the passionate Bridge and the incredible Wil, that had me sucked back in. Their relationship truly made this novel for me. I also experienced some nostalgia while reading this book. For make-ups and break-ups. For moving on and growing up. Although Bridge and Wil, their town, their school, their lives overall did not resemble mine, there was something there that reminded me of the past. This is a novel I will look back on with fondness. I’ve only read one book of hers, but Meg Haston will be an author I watch out for. If you like emotional, character-driven, thoughtful novels, put The End of Our Story on your TBR. You won’t regret it.